The Battle of Murten was released in 1989 to commemorate the battle of Murten (or Morat) that took place on June 22, 1476. 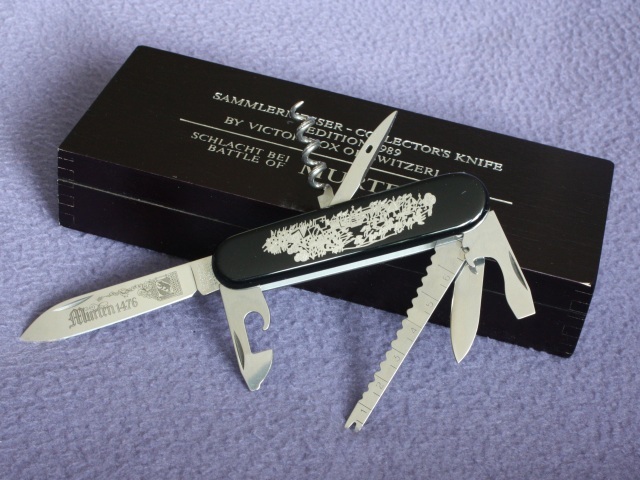 The knife is part of the Victorinox Swiss Allicances and Battle Series knives. This series of seven knives started in 1983 and ended in 1991. This is a rather special knife. It has a unique tool layout: it is basically a Spartan with fish scaler tool (or an Angler without pliers). There is a silver battle scene inlay which shows the Swiss infantry and the Burgundian forces in a battle with the town of Murten in the background. In order to make room for the large inlay, the tweezers are omitted. There is no key ring. The large blade is laser etched with Murten 1476. There were 9999 pieces produced. There is a unique serial number etched in the liner near the corkscrew. The knife came in a black wooden box with a certificate of authenticity. There is also a booklet with a description of the event.